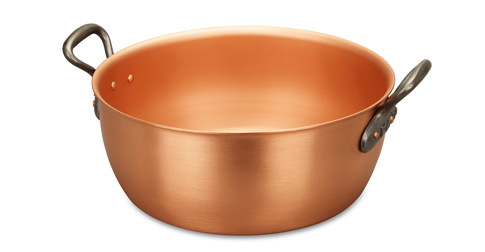 We know you'll love this	28cm copper jam pot	as much as we do. 1113 customers found this review helpful. Did you? Yes, I did! Sweetness knows no boundaries Jam pot - normally used in summer time, to preserver the fleeting taste of the sun. However, I just bought the piece few days back. And already used it. Pear jam was the first to go, and the results exceeded my expectation. The pot is large enough to manage all the ingredients. You can take of them with a wooden spatula without a fear of spilling it over. I can't imagine a better tool for my needs. I heartily recommend it. Perfect! Just what I needed for this year's marmalade. 1052 customers found this review helpful. Did you? Yes, I did! Great customer service Beautiful jam pot but didn't suite my requirements. Was very unhappy but the absolutely spotless customer service made up for it! Very friendly, efficient response, uncomplicated & quick return and refund. Would recommend this company to anyone! Not sure about the pot, I used it on a ceramic hob, might have worked perfect on a gas hob? Copper jam That is very special product I love to made a jam and this is the right decision!